Climate change: must we, can we, will we change? Here at the Australian River Restoration Centre, we love TED talks. We think that they are a great way to share ideas and be inspired. This one is a fascinating look at climate change. In it, Al Gore presents ‘A Case for Optimism on Climate Change’. He poses three questions that will determine the future of our planet, and explains why there is good reason to be optimistic. 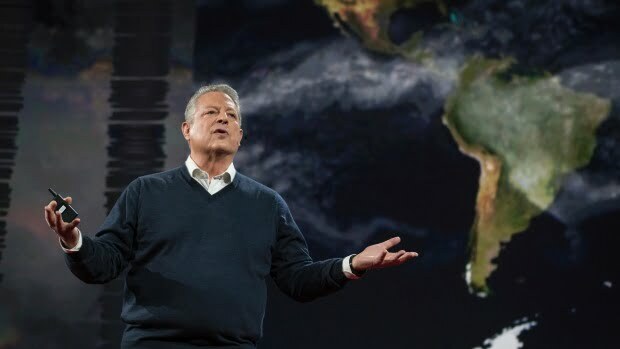 As part of this year’s TED conference (which had the theme ‘Dream’), Al Gore was invited to headline the ‘Nightmares’ session. It would be easy to view the state of our climate as a nightmare, but instead of focusing exclusively on the terrifying aspects of climate change, Gore turned the topic on its head to outline why he’s optimistic and why – even in the face of rising seas and melting glaciers – we can dare to dream of a safe and sustainable future planet. Here are three ideas worth spreading from the talk. This challenge came first. Each day man-made greenhouse gas pollution traps the same amount of heat energy as would be released by 400,000 Hiroshima-class atomic bombs. This trapped heat is warming the oceans and increasing the water vapour and energy in our atmosphere, leading to stronger storms, more extreme floods, increasingly long droughts, and other results he characterised as “a nature hike through the Book of Revelations.” In light of this, it is clear that change is crucial if we are going to protect our planet. Fortunately, we’ve already started to change. Renewable energy is growing exponentially. In fact, its growth has significantly beaten expert projects time and time again. And the cost of solar energy has come down around 10 percent every year for the past 30 years. With all this expansion, the renewable energy transition could very well be the biggest business opportunity in the world right now. This question is up to us – all of us – right now. In December 2015, 195 countries approved the Paris Agreement on climate change and agreed to reduce greenhouse gas emissions. It was truly a breakthrough after decades of failed attempts. Around the world, from China to India to the US, countries are adding more and more capacity in renewable energy. The change is happening – what’s up to us right now is how long we take to get there. Article adapted from The Climate Reality Project. Video from TED. can we change? will we change? do we really have to change?